The Hien Lam Pavilion can be found inside Hue Citadel across the courtyard from the Mieu Temple. It was built in the 1820s in memory of the mandarins who served the Nguyen dynasty. Just in front of the pavilion stand the Nine Dynastic Urns, which were cast in bronze in the 1830s and each dedicated to a different Nguyen emperor. The urns each have their own name and are uniquely decorated with Vietnamese motifs and patterns, which include stars, rivers, mountains, and oceans. After their casting by Emperor Minh Mang, the Nine Dynastic Urns were placed in position according to the altars within the Mieu Temple. Cao Urn stands slightly forward in the center, with the others sitting behind, symmetrical on either side. 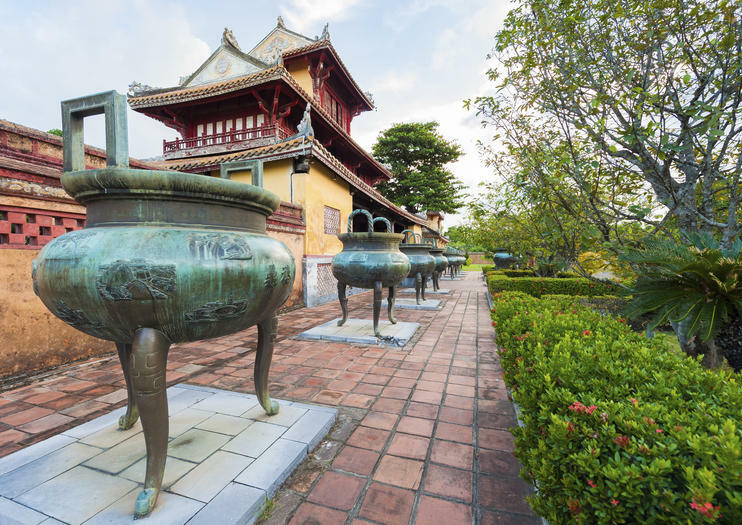 The Nine Dynastic Urns can be found inside Hue’s Citadel. They are located in front of the Hien Lam Pavilion across the courtyard from the Mieu Temple.